Hughes Airwest (Call sign: Hughes-Air) was a United States airline that was backed by Howard Hughes. Hughes Airwest flew routes around the western United States and to certain points in Mexico and Canada. The airline was purchased by Republic Airlines on October 1, 1980. Its headquarters were on the grounds of San Francisco International Airport in unincorporated San Mateo County, California. On July 1, 1968 three local service carriers merged to form Air West; Pacific Air Lines, originally known as Southwest Airways when it was founded in 1941, was based in San Francisco and flew along the coast, linking communities from Portland, Oregon, to Southern California. Bonanza Air Lines, served communities from its Phoenix base westward through Southern California and northward to Las Vegas and Salt Lake City and West Coast Airlines, based at Boeing Field in Seattle, served the Pacific Northwest. The airline's initial fleet included the Boeing 727, McDonnell Douglas DC-9, Fokker/Fairchild F-27, and Piper Aztec aircraft. Hungry for another adventure in the airline industry, TWA's former owner Howard Hughes bought the airline in 1970. The airline was then renamed Hughes Airwest. Its new call sign became "Hughes-Air." Howard Hughes saw his new airline expand to several other cities in the western United States, Canada, and Mexico. The airline participated in some movies in the 1970s, most notably The Gauntlet with Clint Eastwood and Sondra Locke in 1977. At the Las Vegas airport, Locke's character sarcastically called the airline, "Air worst." Like other U.S. local service carriers in the 1970s, Hughes Airwest gradually eliminated many of the smaller communities served and opened new, longer-haul routes. New destinations were added, to resorts in Mexico and domestic routes to cities further east, such as Denver, Des Moines, Milwaukee, and Houston. In 1980, Hughes Airwest was purchased by Republic Airlines, formed in 1979 from the merger of North Central and Southern. Republic was acquired by Northwest Airlines in 1986. 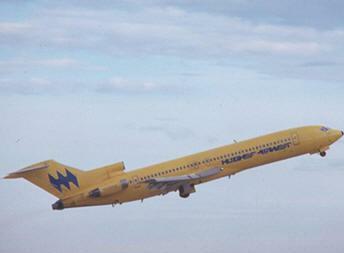 Hughes Airwest's planes were rather recognizable by their banana-yellow fuselage and tail colors. Because of this, their airplanes were often dubbed "flying bananas" and the airline even launched an advertising campaign with the catchphrase "Top Banana in the West". Most nicknames given to Hughes Airwest airplanes in aviation books and magazines have to do with bananas. Apart from their all-yellow scheme, the airplanes also featured a blue logo that resembled three diamonds on their tails (and was possibly a reference to the initials of Howard Hughes.) The name Hughes Airwest, in stylized lettering, was featured below the front passenger windows. This unique livery was devised by the southern California design firm of Mario Armond Zamparelli, following the crash of Hughes Airwest Flight 706 after it was involved in a midair collision with a U.S. Marine Corps F-4B jet fighter near Duarte, California, on June 6, 1971. The company thought the plane's all-white fuselage, now called "Eurowhite," was a contributing factor, so the whole fleet was repainted. The cabin windows also had a metallized PET film coating originally, but this proved too costly to maintain. Following 1980, the all-yellow paint scheme was gradually replaced by Republic's white with blue and green trim.